Rosey Posey in no stranger to the BOTB Pee Wee Race – Kyndra and Rosey will be ready to roll. Here is a little more about Kyndra and Rosie Posey who will be running at the BOTB in August. Where did you and Rosie Posey qualify? We qualified at The Royale in Cloverdale, Indiana! Everyone has a favorite place to run, tell us what yours is: My favorite arena is Simmons Equestrian Center in Negley, Ohio because Rosie runs her best there and loves that pen! Each year we all love to attend a favorite show, what is yours? This year it was The Royale because it was my first big show with Rosie and we qualified for the BOTB, plus my family got to watch us on the live feed! It was very exciting! 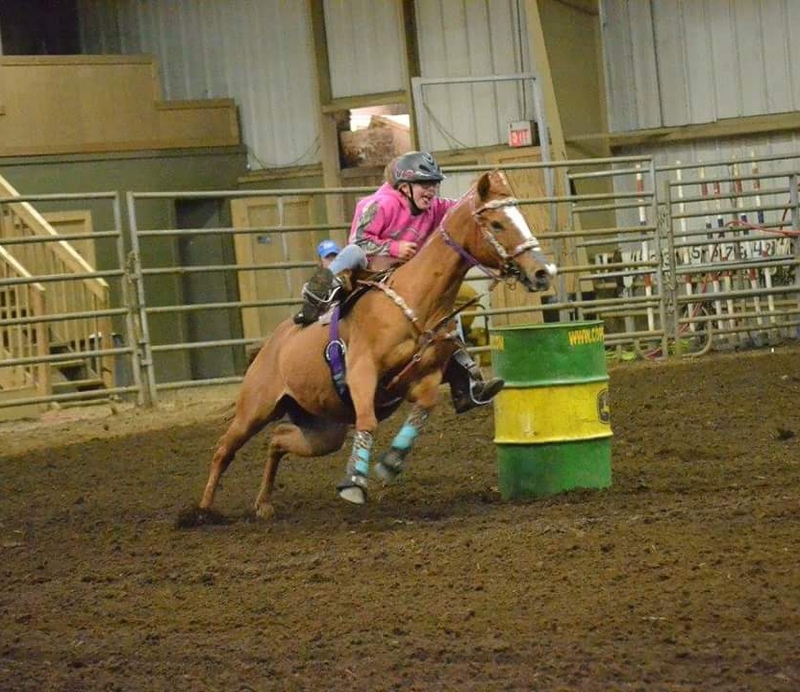 Give us a little more insight about you and your horse: Rosie has helped me grow as a rider; she really takes care of me and has shown me how fun barrel racing can be. I’m thankful to own and run a pony like her. I love her so much! My Mom is someone who inspires me because she encourages me to set goals and work hard towards achieving them. She supports me and is always by my side. My dad can’t always be at each show, but checks in on me often. My sister, Nana and Papa are always there to support and cheer me on too! A special thank you to Dawn, Clea, and crew for putting on these amazing shows for all of us…we love them!!! PS Thank you for the kind words – we enjoy seeing you kids having a great time. Next Nina and Lily are hoping to follow in her Daddy’s footsteps with a BOTB win – Pee Wee Win that is! Kyndra, alias Pnut, Had the time of her life at BOTB show. She was treated like royalty and felt very special. As grandparents, We certainly enjoyed being there to see that and the whole production. You all put on an amazing well orchestrated event. Everyone was very kind and considerate. Thankyou. And hope to return!